The Teton mountain range is somewhat unique in that it looks very different from the western side versus the eastern side. The western side has rolling foothills which fits our picture of most mountain ranges. On the eastern side, when the mountains were thrust upward, the eastern plane dropped leaving dramatic sheer cliffs extending some 6 to 7,000 feet above the plane that extends from its foot. 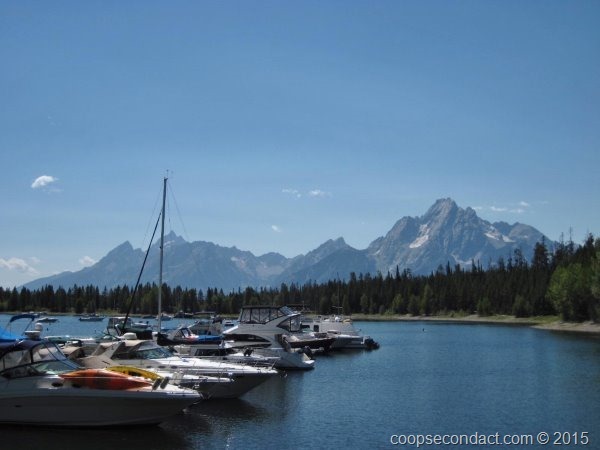 The mountain range and the lakes alongside it were designated a national monument in the 1920’s but it took John D. Rockefeller to combine it with the valley to the east to form the Grand Teton National Park (pics). The Rockefellers visited this area often and had a ranch along the southern part of the range. John became concerned about some of the commercial enterprises that began to spring up along the edge of the Teton National Monument. 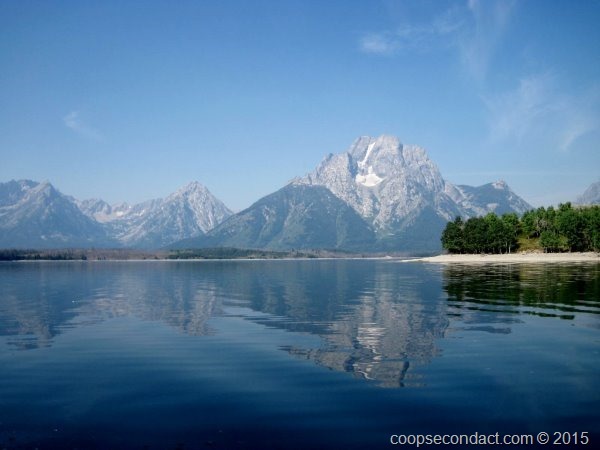 He began buying this land until he had accumulated 32,000 acres which he offered to the US government if it would provide protection for all of the land along the Teton range. Thus in 1950 the national park was born. By the way, for the first time, I now understand the difference between Jackson Hole and Jackson, WY. Many people refer to the town of Jackson as “Jackson Hole”. In fact, “hole” is a term used by trappers who first explored the valley east of the Teton mountains. Basically, it’s any area bounded by mountains so this valley is a huge hole. Jackson Hole was named by the trappers and refers to this entire area, which includes all of the national park except for the mountains, but the town to the south of Grand Teton National Park is simply, Jackson, WY. Also, this was our first experience with dry camping, essentially, parking the RV without hookups for water or power. We parked in the Colter Bay campground inside Grand Teton National Park which has some sites with electric service but everything is on a first come basis. So we spent the 4 nights here without the benefit of utilities, TV or WiFi. Of course, we do have batteries and a generator so now we have a better idea of what appliances and functions are available to us on battery vs. generator vs. shore power. Aren’t we just roughing it?